I posted this originally in 2013, it is still very current. I find this debunking of the use of NULC fascinating. 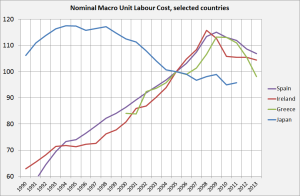 The post 2008 decline of Macro Nominal Unit Labour Costs (NULC) in Ireland was not caused by austerity of wage restraint. It was caused by the housing bust (source: Eurostat, CBS). Which can’t be explained by neoclassical macro models. But which can be explained by simple arithmetic. Are the European authorities destroying the Greek economy in order to “save” it? A rather damning comment on European policies regarding Greece. There is a tense standoff right now between the Greek government and the European authorities – sometimes known as the Troika because it includes the European Commission, the European Central Bank (ECB), and the International Monetary Fund (IMF). ECB President Mario Draghi denied this week that his institution is trying to blackmail the Greek government. But blackmail is actually an understatement of what the ECB and its European partners are doing to Greece. It has become increasingly clear that they are trying to harm the Greek economy in order to increase pressure on the new Greek government to agree to their demands. We do live in a very absurd world. I wish articles like these would pay more attention to the role of Finland in this whole farce. Small country, yes, but with a hard line. Europeans have been amused in recent weeks by the difficulty that Republican presidentialcandidates have with the theory of evolution. But these cognitive problems will only matter if one of these people gets into the White House and still finds himself unable to distinguish myth from reality. By contrast, Europe is already suffering enormous pain because the people setting economic policy prefer morality tales to economic reality. This is the story of the confrontation between Greece and the leadership of the European Union. The northern European countries, most importantly Germany, insist on punishing Greece as a profligate spender. They insist on massive debt payments from Greece to the European Union and other official creditors to make up for excessive borrowing in prior years. I first though this was implausible, but have seen other posts noting that the ECB ‘lifted the waiver’ for Cypriotic bonds in 2012-2013 before shutting Cyprus out, and according to another blog the ECB has used this measure against Greece in 2012 when negotiations got tough. I hope the ECB is not doing another ‘Cyprus’ because then it will have lost all of its credibility and the belief that it negotiates in good faith. Update (20:56 CET): Rumor has it that the ECB has 59,5 billion in Emergency Liquidity Assitance available. But, to be credible, it should be willing to provide backing for every single Greek deposit Euro. The ECB is preparing a ‘Cyprus’ for Greece. So, dear Greek, exchange your deposit money for cash.